Do you have some scrap vinyl laying around just waiting to be used? 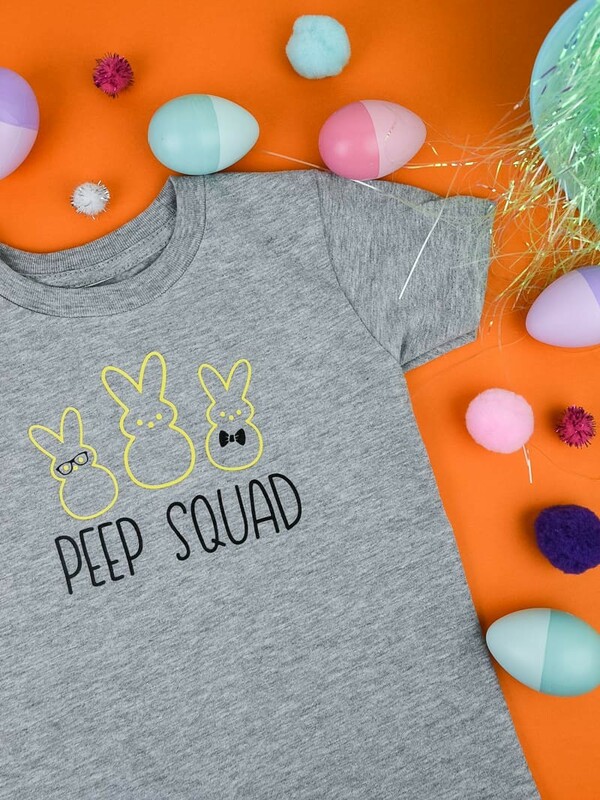 If you’re into geeky shirts this Peep Squad Easter Shirt is the PERFECT design to use your scrap pile on. I think Peeps are one of those candies that you either love or you hate. As I kid I loved them. I probably took after my mom a bit because she was obsessed with them. If you got her an Easter basket full of peeps she would be thrilled. But she couldn’t just eat them straight out of the package. OH NO. She would open them so they’d get stale and then eat them. Apparently they were better that way. Now that I’m older I can’t really stomach the candies anymore. I mean, I am the queen of sugary treats but the peeps are just too sweet for me. But that doesn’t mean I don’t appreciate a good peep pun. 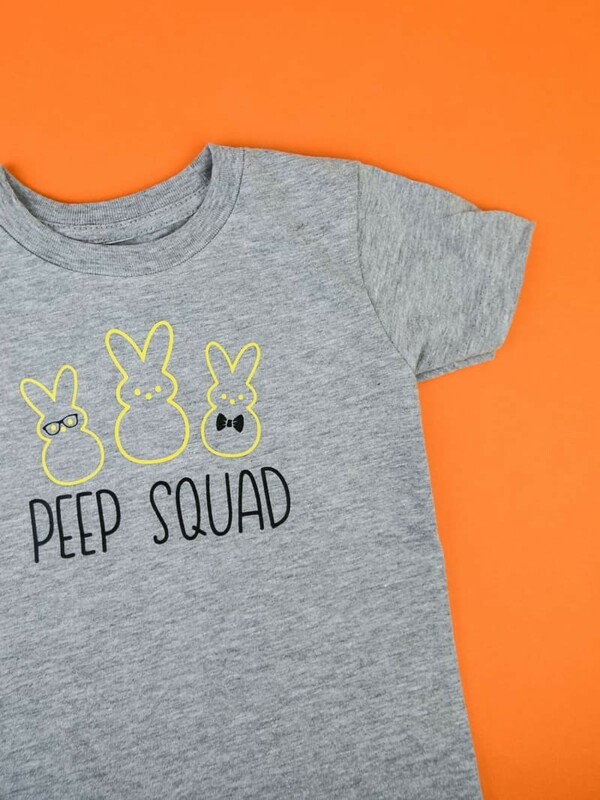 Which is kind of how this Peep Squad Easter shirt came about! I was actually looking for Peep shirt inspiration on Pinterest yesterday and I just wasn’t finding anything I really loved. Everything was too cutesy for me and I really wanted something geeky for my toddler. Cutesy is fine most of the time but I wanted something a little more simple and neutral. I ended up going through three or four different designs before settling on this one. I’m sure my friends were getting a little tired of my “what do you think of this one?” texts I kept sending them with new designs every 10 minutes. I’m glad I settled on this one though because it’s just too cute! Because who doesn’t like a peep with a bowtie? Let’s make a Geeky Peep Squad Easter Shirt! + Download your free file, cut it out, and weed the design. + Heat up your iron and set it aside. + Measure about an inch down from the collar and place the design on your shirt. PRO TIP: Because you have two colors in your design you will have to press each color separately. The hardest part is lining them up correctly, but I will walk you through it! + I did the black layer first! To find out where the middle of your design is fold your transfer paper in half (sticky side away from each other!) and then line up the crease line on your transfer paper with the crease line on your shirt. + Cover the design with your teflon sheet and press for 10-15 seconds. If the transfer paper comes off without pulling the design with it, set it aside and grab the second color of your design. + Fold the yellow peep transfer paper in half to find the middle of the design. Line it up with the black layer that is already on the shirt. Your transfer paper WILL NOT cover both the yellow and black layers (don’t worry about this yet). Cover the yellow design with your teflon sheet and only press that part of the design. Make sure your iron (or heat press) does not touch any part of the design that isn’t covered by transfer paper. Then press it for 10-15 seconds. + If you can pull up the transfer sheet and the vinyl sticks to the shirt, you’re good. If it comes up with the transfer sheet, press for an additional 5-10 seconds. + Cover your entire design with transfer paper and your teflon sheet and then press the entire design for another 10-15 seconds. TA-DA! You’re done! Even though there are a lot of steps to making this Peep Squad Easter shirt it’s actually really easy! And because it doesn’t take a lot of vinyl it’s the perfect project to use up those scraps. You could even make yours super colorful or keep it kind of minimal (like I did). Whatever way you choose to show your geek side, you’re sure to look adorable! Check out some other reader favorite Springtime projects! more 20 minute craft projects! This turned out oh so cute! I love it! This shirt is adorable – and easy to make! I’m a little late on this year, but I think I’ll have to make these for next Easter!